Coprinus subpurpureus A.H. Smith in Mycologia 40: 684. 1948. Closed pileus up to 15 mm high, up to 35 mm in diam. when expanded, dark vinaceous brown at centre, paler towards margin. In age 'dark purple drab' over disk and dark grey to blackish over margin. Lamellae narrowly adnate, whitish to black. Stipe 40-100 x 1-3 mm, dull lilac umber when young, rarely pallid, becoming paler in age, densely pubescent-pubescent but soon glabrescent; base white-strigose (macroscopic description after A.H. Smith, l.c.). Spores (from type) [20/1/1] 9.0-11.5 x 5.6-7.0 µm, av. L= 10.2, av. B= 6.5 µm, Q= 1.45-1.65, av. Q= 1.60, ellipsoid to ovoid; germ pore eccentric, c. 1.8 µm wide. Basidia 16-40 x 8-10 µm, 4-spored. Pseudoparaphyses 3-6 per basidium. Cheilocystidia vesiculose, 40-85 x 25-45 µm. Pleurocystidia absent. Pileocystidia 45-100 x 7-14 µm, lageniform with (sub)cylindrical neck and even to clavate, 4.5-9 µm wide apex. Sclerocystidia absent. Clamp-connections present. In moist leaves or on wet black muck. Gregarious or solitary. 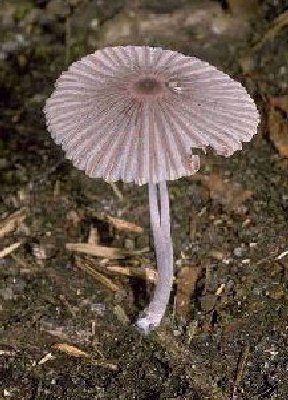 Coprinus subpurpureus should be distinguishable from C. plagioporus by its pileocystidia with a cylindrical neck and not or weakly enlarged but not capitate apex and its more purple colour. 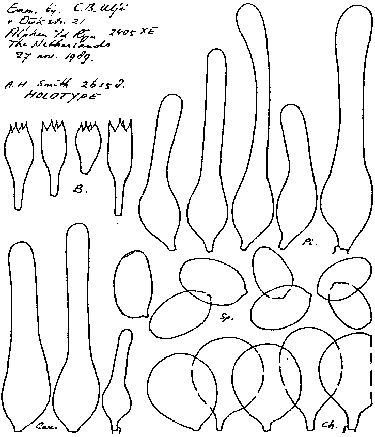 Collections that have pileocystidia with a subcapitate apex have to be named C. plagioporus because the apex of the pileocystidia in C. plagioporus is not always distinctly capitate. It should mentioned that there is a great difference between the size of the spores given in the original description and that in our own measurements on the type material (12-14 x 7-8 µm versus 9.0-11.5 x 5.6-7.0 µm). Coprinus fallax is another probably closely related species; but should have a more reddish spore print (see also the discussion under C. plagioporus and C. fallax).